During a 2009 visit to Pyongyang to seek the release of two detained American journalists, former U.S. President Bill Clinton raised the issue of abducted Japanese nationals with then-leader Kim Jong Il, a hacked document released by the secret-spilling site WikiLeaks has shown. The memo, attached to an email sent to John Podesta, a former Clinton White House chief of staff who joined the ex-president on his mission, is part of a trove of emails released by WikiLeaks. Podesta, head of the liberal Center for American Progress think tank at the time, now serves as the campaign chair for Democratic U.S. presidential nominee Hillary Clinton’s White House bid. WikiLeaks has been publishing emails since Oct. 7 from Podesta’s account, which experts say was targeted by Russian hackers. Apparently written by David Straub, a Stanford University professor who also took part in the visit, the memo details the unusual meeting with the reclusive Kim, providing a rare glimpse into the thinking of the now-deceased Dear Leader. The Japan Times attempted to contact Straub to confirm the authenticity of the memo, but had not received a reply as of publication. 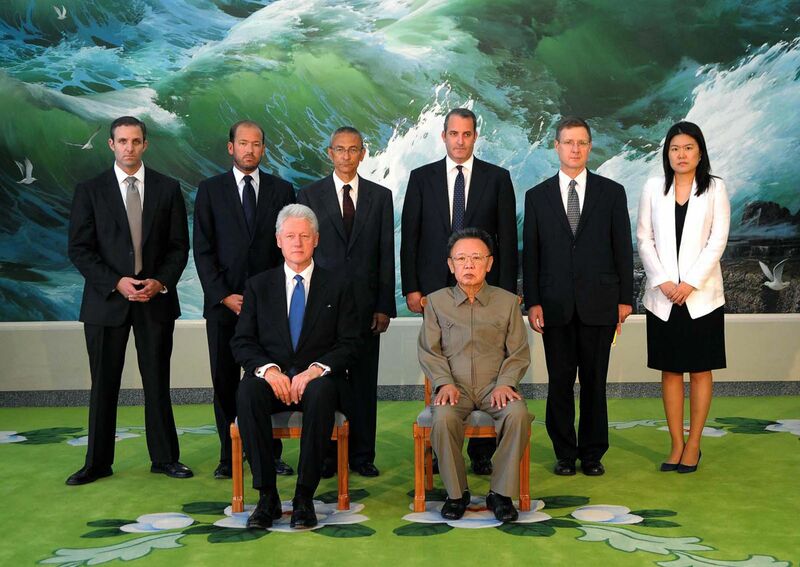 Clinton, who met with Kim in August 2009 in a bid to free reporters Laura Ling and Euna Lee, spoke with Kim on a variety of issues, including a future visit by the former president, the North being labeled part of the “Axis of Evil” by President George W. Bush, as well as Pyongyang’s systematic kidnapping of Japanese citizens in the 1970s and 1980s. In September 2002, Pyongyang admitted that it had abducted Japanese nationals and apologized during a visit by Japan’s prime minister at the time, Junichiro Koizumi. A month later, five abductees returned to Japan. As for the remaining Japanese abductees, Pyongyang has yet to provide any acceptable explanations — despite promises to do so — according to Japan’s Foreign Ministry. The Japanese government has identified 17 of its citizens as victims of abduction, though some believe the true total could be far higher. During the Clinton-Kim meeting, the former U.S. president told the North Korean leader that politics in Japan “were in great flux” and that “major changes were coming,” according to the memo. “When Prime Minister Koizumi visited the DPRK, he had been trying to change Japan from the LDP out, but he was not quite able to accomplish his goal,” the memo quoted Clinton as saying in reference to the North’s official name, the Democratic People’s Republic of Korea, and Japan’s ruling Liberal Democratic Party. Clinton, who was called “a leader of etiquette, confidence, and loyalty” by Kim, went on to urge the North Korean strongman to release all detained South Koreans and resume the investigation of the Japanese abductees. While the former U.S. president stressed that he was speaking as an observer, he said that “an enormous opportunity” had presented itself to the North. “South Korea and Japan had wanted him to raise the issues … because they want a better relationship with the DPRK,” the memo cited Clinton as telling Kim. “With the right efforts, it would be possible to achieve a final peace treaty, pledges of non-aggression, and help for the DPRK from all Six Party partners, beginning with a non-aggression pledge,” it said in reference to the six-party denuclearization talks involving the two Koreas the U.S., Japan, Russia and China. The six-party talks hit a roadblock just months before Clinton’s visit when Pyongyang was lambasted for its test of a satellite using missile technology banned under a U.N. resolution. The North quit the talks shortly thereafter. But Clinton apparently used the Kim meeting to try to convince the leader to return to the talks. “If the DPRK denuclearized, it could also insist that its security concerns also be addressed. … But under the present circumstances, the president could not walk away from the Six Party Talks,” Clinton said of President Barack Obama. The issue, Clinton said, was whether the North would find a way to simultaneously hold bilateral talks and adhere to the six-party framework. But, he said, the North “must not make President Obama pick between a bilateral relationship and the Six Party Talks,” noting that “there is more than one way to skin a cat” — likely an allusion to finding an alternative solution to the denuclearization of the Korean Peninsula. Despite Clinton’s effort, the six-party talks have remained on life-support since 2009 and ties between the U.S. and North have progressively worsened amid Pyongyang’s ramped up nuclear and missile programs under Kim’s son and successor, Kim Jong Un. At the close of their meeting, Kim also expressed the hope that Clinton would return to the North, both officially and unofficially — a hint at just how much the former president had ingratiated himself with the North Korean leader. Another visit would never happen, with Kim dying a little over two years later in 2011.